It’s here and it’s hot! 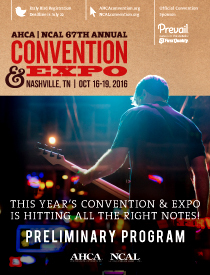 This year’s AHCA/NCAL Convention & Expo Preliminary Program is now available online! You can even read it on your mobile devices. Take a look at what Nashville has in store for you October 16-19 in this easy-to-access, easy-to-read flip book. This year's Convention & Expo offers national keynote speakers, valuable education, professional networking, exciting exhibits staffed with experts ready to help your company excel, and music, of course! In the spirit of the Grand Ole Opry, the Gala Dinner & Show (separate ticketed event) features three artists, each with their own unique style and sound. You’ll enjoy an evening with award-winning county artists Charlie Daniels, Jo Dee Messina, and Phil Vassar. Once you preview the electronic Preliminary Program, you’ll be inspired to register for the AHCA/NCAL Convention & Expo. Early bird registration and savings continue through July 22.